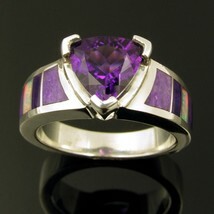 Australian opal and sugilite ring featuring a 1.6 carat trillion cut Amethyst set in sterling silver. 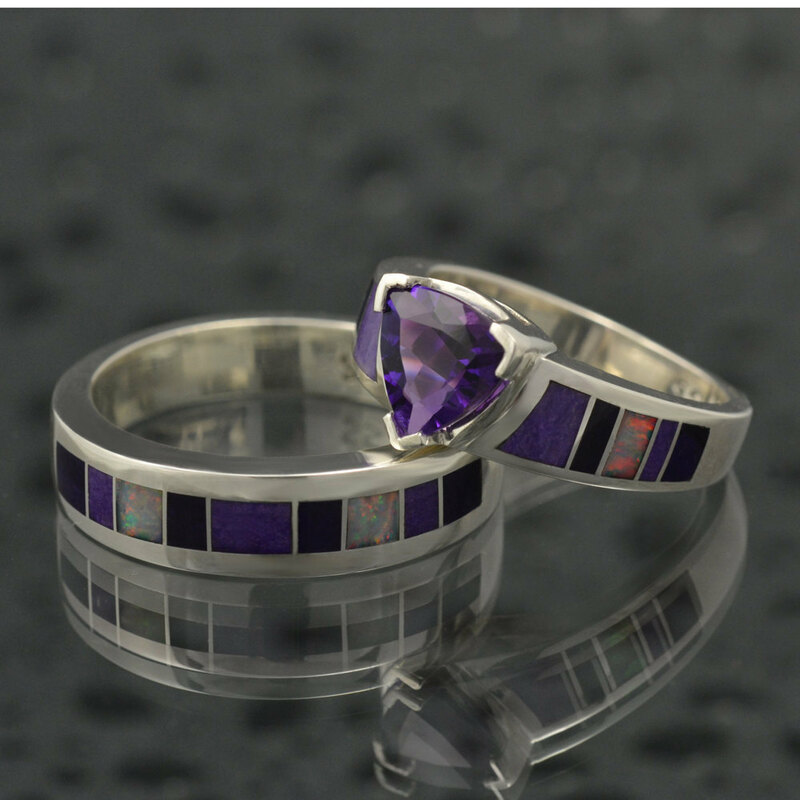 Inlaid lavender and purple sugilite combine with red Australian opal for a striking accent to the 8mm trillion cut purple amethyst. 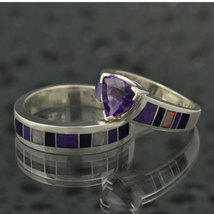 The ring is 9mm wide at the top and tapers down to 3.5mm at the bottom. The sample ring (sold) in the photo is shown in a size 6 for scale. 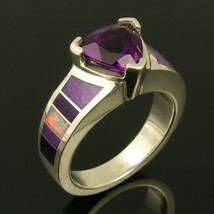 This ring will be made to order in your ring size in 4 to 6 weeks. Just select your ring size from the drop down size menu. Please add your phone number in the note to seller section at check out for UPS shipping. The matching man's wedding band (style M200) in the photo is also by special order. 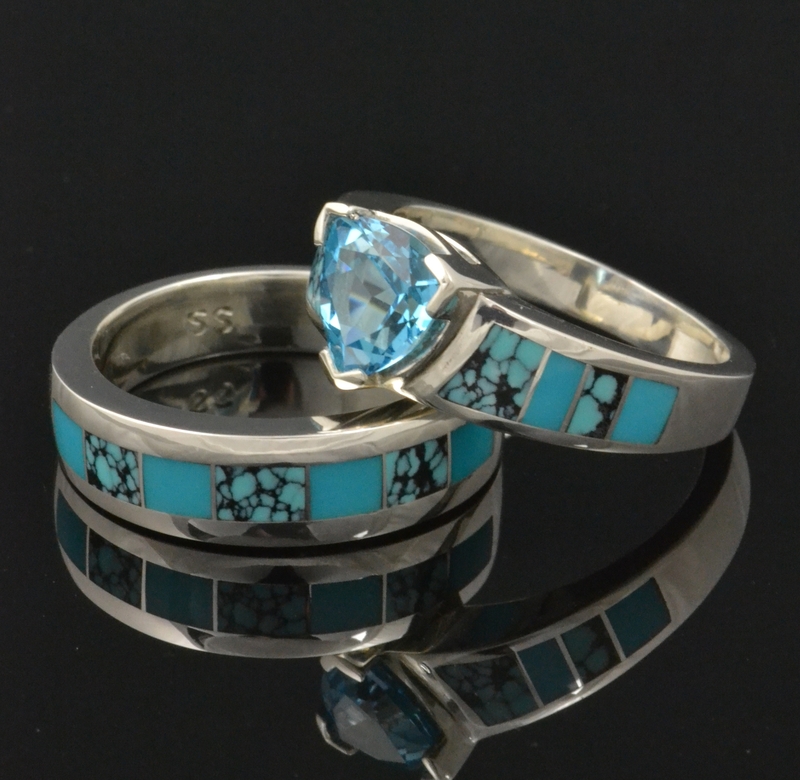 Also available in turquoise as pictured in the last photo. (Listing is for the amethyst ring only!) Amethyst boasts the color of royalty, a rich violet-purple and is the most highly prized variety of quartz. Amethyst is cleansing, both physically and psychologically. It helps promote internal balance, harmony and stability. Amethyst also helps sharpen the conscious mind and enhances one’s mental powers. It is used to improve memory and keeps thoughts in line with life goals. Amethyst is the stone of pure, true, emotional love. About Sugilite Sugilite is named for the Japanese geologist who discovered the first specimens in 1944, Ken-ichi Sugi. In 1975, the only known deposit of gem grade sugilite was found in the Wessel Mine in the Kalahari Desert near Hotazel in Kuruman, Republic of South Africa. At first it was thought to be a very small sugilite deposit, but later found to be a commercial sized deposit estimated to contain as much as ten to twenty tons located 3,200 feet below the surface. Sugilite commands a high price for an opaque gem material, due in part to the difficulty of removing it from such a great depth. It is thought that sugilite strengthens the heart and promotes physical healing as well as reducing stress by balancing the mind, body and spirit. Sugilite seems to protect against and dissipate anger and other negative energies by encouraging peace of mind, a general feeling of well being and spiritual love. Australian opal information Opal is a tightly packed array of millions of spherical particles of amorphous silica (SiO2 NH2O). Opal has a hardness of 5.5 to 6.5 on Moh’s Scale. It is the only gemstone known to man to have the natural ability to diffract light. An opal’s color is created when the voids between the particles split light entering the stone. The size and alignment of the spheres and voids, as well as the light source, determines the colors produced. To view an opal’s color play at its best, the light source must be coming over your shoulder. An opal’s color can cover the full spectrum of the rainbow. Opal has been mined worldwide; however, Australia accounts for 96% of all commercial opal and is the main source of precious opal. Opal is mined in many locations throughout New South Wales, Queensland and South Australia. The main areas of production are Mintabie, Lightning Ridge, Coober Pedy, Andamooka and Queensland. Most opal in Australia is found in Cretaceous rock with one exception; opal from the Mintabie area is found in Paleozoic rock. Opal may form in vertical or horizontal seams in the sandstone as well as in fossilized formations. Because of the unique conditions under which opal is formed, it is nearly impossible to find two opals exactly the same.